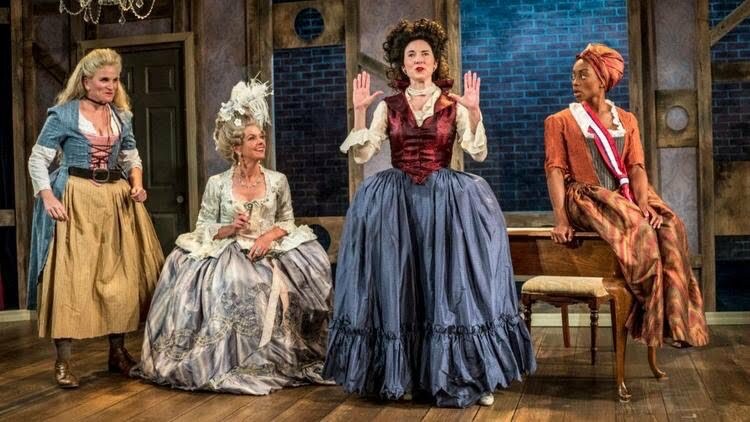 Carol's Theatre Reviews ~ It's Fun To Go Out: “The Revolutionists”: Women Power on the Rise (again) at Moxie! “The Revolutionists”: Women Power on the Rise (again) at Moxie! In Lauren Gunderson’s “The Revolutionists” now in a well polished, and delightful production at Moxie Theatre through June 25th, the four women in her play are characterized as ‘badasses’. Keeping in mind that the play is set in Paris, France during the ‘Reign of Terror’ (1793). That was then. Today in 2017 women are still fighting for their rights. Think ‘Women’s March on Washington’. Just recently Lamb’s Players Theatre in Coronado mounted a stunning production of Gunderson’s “Silent Sky” about little known astronomer Henrietta Swan Leavitt. 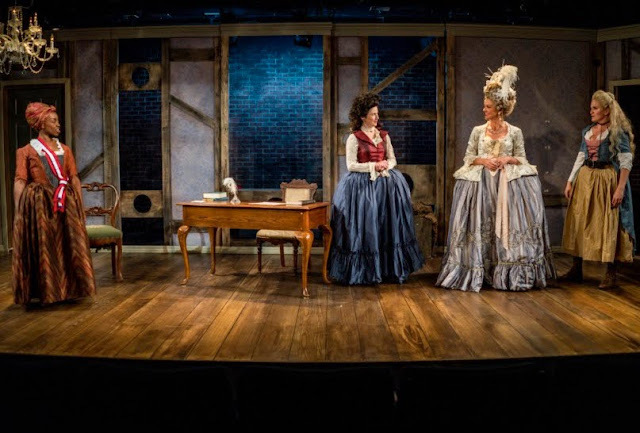 A bit further back in 2016, New Village Arts Theatre in Carlsbad mounted “Emilie La Marquise Du Châtelet Defends Her Life Tonight”. To say that she is a defender of women’s rights would be an understatement of great magnitude. In “The Revolutionists” we are introduced to four different women who are willing to die (well?) for their cause: Olympe De Gouges, Marianne Angelle, former Queen, Marie Antoinette and Charlotte Corday. De Gouges (Jo Anne Glover) is a badass playwright who wants to write a play to “show the boys how a revolution is done.” History will vouch for three of the women mentioned. But De Gouges is suffering from writers block. As France’s famous and most zealous feminist, her 1791 ‘Declaration of the Rights of Women and Citizen” she is in the forefront of a women’s movement, especially in the minds of the male population. Now she is at a loss for words. Marianne is her trusted friend and ally as well as a free black woman who is pushing for support for the slaves and colonial independence in Haiti where her husband is now living. Marianne Angelle (Cashae Monya) is a figment of Gunderson’s imagination but has an important role to play as the most grounded, most logical and the most sensible of the four. Cashae’s Marianne is low keyed and speaks to the realities of the plight of slaves in the colonies. 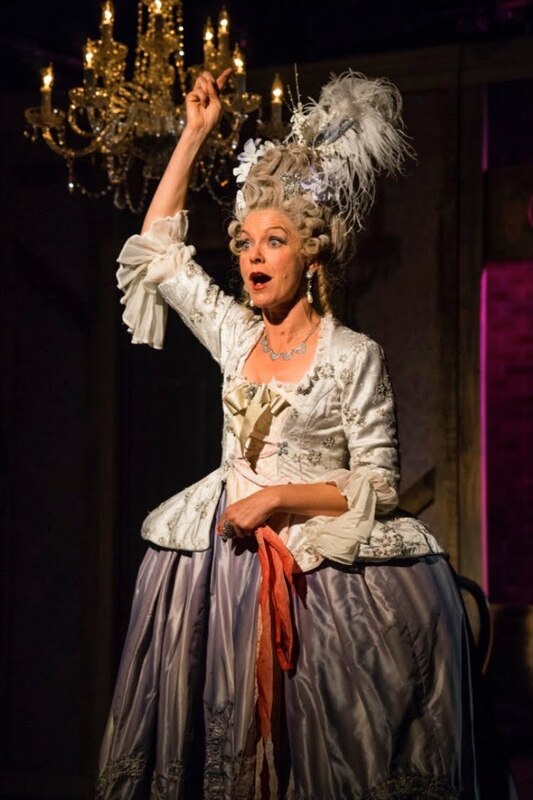 She is also the one character to keep Olympe on the straight and narrow when it comes to ideas about her writing this newly minted play about the revolution, which may or may not become a reality. 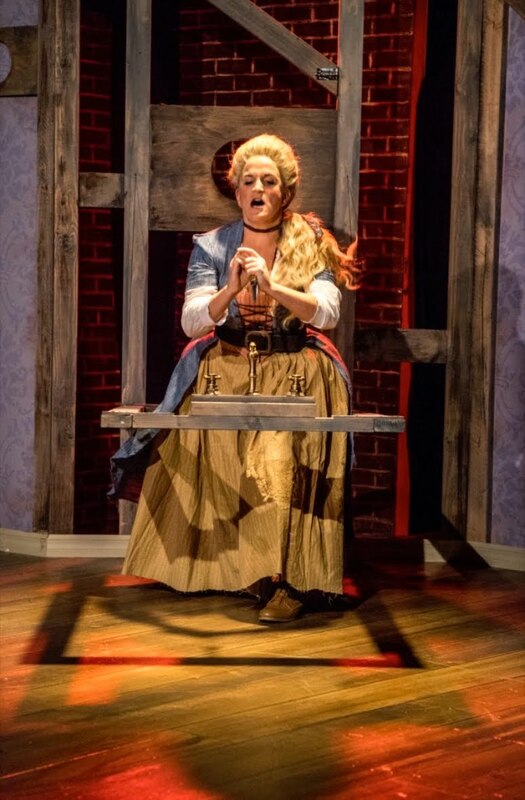 Charlotte Corday (Samantha Ginn) knows she will die for her act of courage. She plans to kill Jean Paul Marat and makes no bones about it. She wants to make sure she is remembered and a needs someone worthy to write her last words before the guillotine comes down. Ginn, in keeping with her effervescence, comes to table with an abundance of energy almost too much, but nonetheless a showstopper when she actually pulls off the assassination. Gorell-Gets is simply delicious as the ex-queen who doesn’t seem to understand why ‘one day she woke up in a palace and went to sleep in a prison-not exactly a prison-it was one of the lesser bedrooms’. “The whole country would celebrate my birthday. How did it all turn into this rudeness and murder?” Her depiction of Marie is right on target and it’s fascinating to watch her facial expressions as she tries to understand her predicament. She just doesn’t get it. 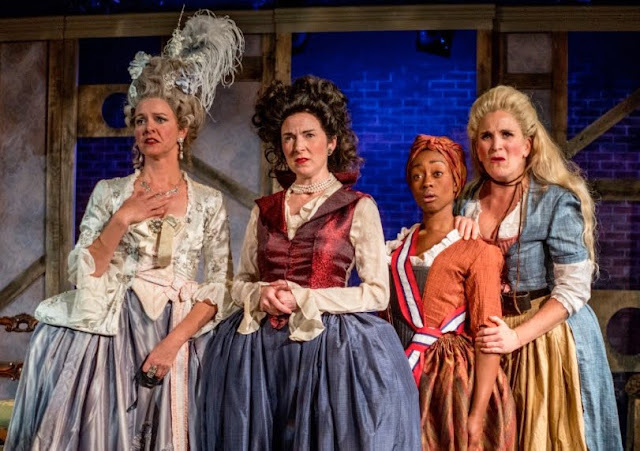 Gunderson’s “The Revolutionists” is playful and good-humored, up to date, innovative, and with enough theatre references to give every theatre lover a chuckle. Her “Tramedy” Olympe’s words) is about three very real and courageous women. The resilience, activism and tragic endings of those and others living through the “Reign of Terror” in France and wanted to make a difference are right on the radar range of current events. Missy Bradstreet’s wigs are one for the century, Jennifer Brawn Gittings costumes are perfect period, Sherrice Mojgani is credited for the effective lighting, Emily Small’s set suggests small guillotine’s in every patch of wood and Rachel LeVine’s sound design gives a sense of crowds in the background. No credit is given for the masks, but they are pretty frightening. The production itself under the direction of co founding mother Jennifer Eve Thorn puts four very talented and yes, on target women at the forefront and gives them wings to fly. There’s so much more to learn about these women in this playfully cooked up historical comedy, but do see it for yourselves and enjoy.